On Monday 13 February, 140 people gathered at the Canterbury campus at a conference on ‘Understanding Fundraising’ organised by the Centre for Philanthropy. In keeping with the Centre’s goal to be a bridge between academia and practice, attendees included fundraising scholars from across the UK, mainland Europe and North America as well as representatives from large and small charitable organisations. Lively discussions on how race, gender, cause area and donor desires affect fundraising success, as well as the ‘invisible’ nature of the fundraising role, ensured a buzzing and intellectually stimulating atmosphere. 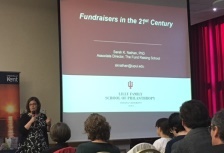 The conference was an opportunity to showcase research conducted by both colleagues and PhD students in SSPSSR, including projects on gift giving, fundraising in schools, and the personal and social characteristics of successful fundraisers. It was also an opportunity to spread the word about our new MA Philanthropic Studies, which is delivered part-time by distance learning and designed with the needs of both practitioners and aspiring scholars in mind.